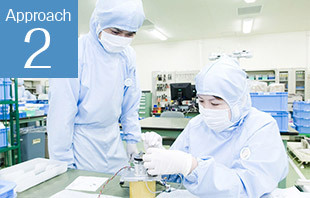 Due to an increase in high refinement and reliability in the semiconductor industry, enhanced cleanliness has been required in manufacturing semiconductor equipment and devices. JEL's workers in clean rooms wear clean clothes, masks, and gloves to avoid any dust particles on products. JEL manufactures all products in clean rooms. There are 3 clean rooms with cleanliness of class 10,000 (class 1,000 when unloaded) and one clean room with cleanliness of class 100,000. Also, a clean booth with cleanliness of class 1 is installed in a clean room with cleanliness of class 10,000. As part of activities to enhance cleanliness, all employees clean up their work space and surrounding area of the company as well as clean rooms every day. Cleanliness of clean rooms is measured by tightly defined standards. 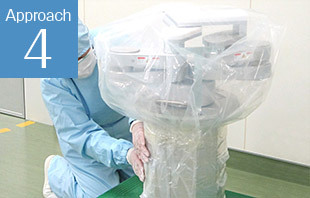 The classification of clean room Class 10,000 under US FED standards, for example, indicates the air of 1 cubic feet (= 1 ft3) (30.5 cm on each side) contains a maximum of 10,000 particles of 0.5 µm or larger. The size of 0.5 µm（=0.0005 mm）is the unimaginable smallness, considering that the average size of a human hair is approximately 50 to 70 µm in diameter and the average pollen particle is under 10 µm. JEL's clean rooms are designed to change the air through HEPA filters (99.97％) to maintain the cleanliness. 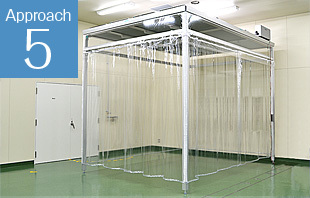 (Air change rate of Clean Room 1 and Clean Room 2: 25 times per hour). Workers at a manufacturing site are obligated to wear clean clothes, masks and gloves, realizing a consistent manufacturing line. By raising the awareness of wearing them, we are engaged in creating a clean working environment. 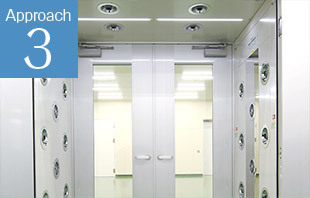 It is mandatory to pass through the air shower to enter a clean room. The air shower removes hairs or dust particles from worker's clean clothes before entering a clean room. After conducting product inspections, primary packaging is carried out in a clean room to prevent attachment of dust or stain. The high sealability isolates the products from outside air. Clean Booth（Area of about 11.6m2 (Outside Dimension: W2895 x L4020 x H3525)) with ULPA+PTFE filter (99.9999% (particle diameter of 0.1 µm)) for measurement of cleanliness.